Nick Kyrgios was at his entertaining best as he breezed into the fourth round of the Miami Open, twice winning points with an underarm serve and waving goodbye to a fan who was escorted out after a verbal battle with the Australian. The 23-year-old easily accounted for world No. 44 Dusan Lajovic 6-3, 6-1, in just 57 minutes, but as is often the case with Kyrgios the scoreline was secondary to the entertainment. The fiery young Aussie won two points in the opening set, including set point, with an underarm serve, which left Lajovic stunned and had the crowd jeering. After the first, Kyrgios exchanged words with a member of the crowd, who apparently made fun of the Australian’s haircut. “Did you get a free ticket?” Kyrgios asked the spectator. “Why are you watching me on a Sunday night? 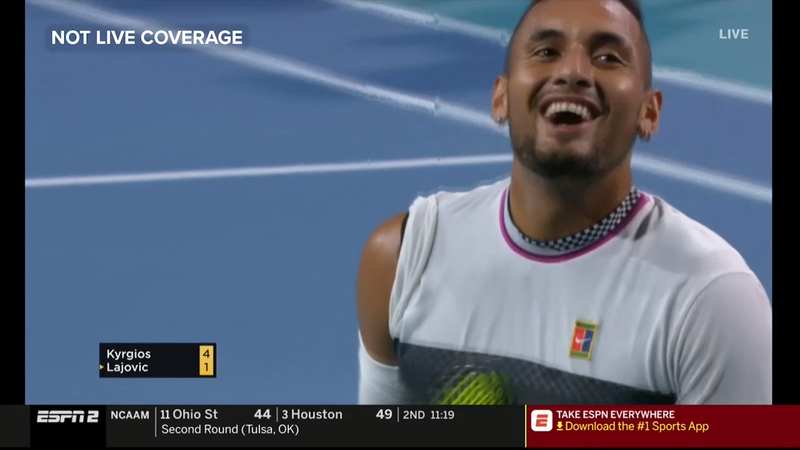 Kyrgios laughed as he traded barbs with the spectator, who stood and appeared to gesture for the Australian to come closer, while the unfortunate woman sitting next to him looked like she wished she was elsewhere. During the next game Kyrgios received a code violation for delaying the server, as he continued the verbal volleying with the spectator, at one stage giving him a ball. As security escorted the man from the court a short time later, Kyrgios waved goodbye and the crowd cheered. As well as the underarm serve, Kyrgios also threw in a tweener and a no-look shot, displaying the full repertoire as he brushed aside Lajovic. Kyrgios slammed down 12 aces, with the exhibition including a 81 percent win rate of first-serves in play. He also unleashed a number of sizzling forehands. It was the kind of form that saw him defeat both Rafael Nadal and Alex Zverev on the way to winning the title in Acapulco earlier this month. Kyrgios also tried the underarm serve during his win over Nadal, with the Spaniard accusing him of lacking respect for his opponents and the crowd, although Kyrgios subsequently earned the support of Roger Federer, who said it was a fair tactic when the receiver was standing deep behind the baseline. He’ll now play 11th seed Borna Coric in the fourth round, after Coric took more than two-and-a-half hours to down Jeremy Chardy in three sets, while a potential quarter final against either Felix Auger-Aliassime or Nikoloz Basilashvili beckons.